Journalists have taken to calling Edward Snowden a whistleblower, but that is only part of the picture. Whistleblowers don’t usually wind up living in exile without a passport. Snowden is an outlaw in the original sense of the word: someone who is outside the law. He is the citizen of no state. He has no legal protection from anyone. He has one patron, Vladimir Putin, a person you would not choose as a patron unless forced to. 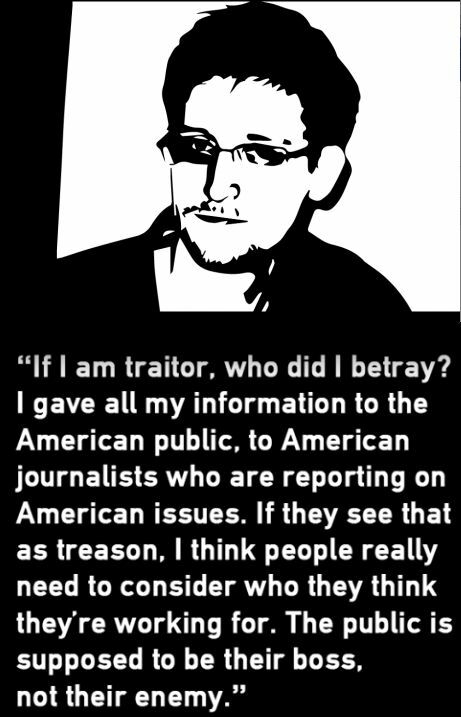 At least journalists don’t routinely call Snowden a traitor. The feds who want to capture him, and who promise him a fair trial, are accustomed to calling him that. No one needs to point out you can’t be a whistleblower and a traitor at the same time. Whistleblowers in government are good citizens. Traitors are not. Snowden’s disclosures called attention to illegal activity in government: that counts as blowing a whistle. More provocatively, Snowden’s decision to lay bare unconstitutional NSA programs to spy on U. S. citizens was an act of civil resistance, and civil disobedience. That’s why authorities hate him as they do. That’s why he is forced to live abroad. Authorities know that if Snowden does not suffer the most grievous punishment possible, no secret of theirs is safe. Suppose Snowden returns to the United States a hero. Suppose a future president rewards him with the Medal of Freedom. Suppose both Edward Snowden and Chelsea Manning go to the White House to receive that honor. How could the national security state ever feel safe again? Garden variety whistle blowing involves telling the press about the Pentagon’s five thousand dollar toilet seats. Our normal conception of whistleblowing does not include attempts to bring down a secret surveillance regime that feeds on fear, intrusion, and implied threats. Snowden did not try for notoriety, but his act of civil disobedience guaranteed him a place in our country’s select rank of patriots willing to sacrifice their own freedom to preserve ours. Somehow ‘whistleblower’ doesn’t capture that sacrifice. Whether you call Edward Snowden a whistleblower or something else, he did not need to reveal who he was. He could have kept the national security state and the rest of the world guessing. If he had stayed anonymous, however, he could not have worked to remind citizens about the consequences of the NSA’s illegal activities, which remains his paramount aim. He has said many times he does not want to draw attention to himself, but he certainly wants to draw attention to what he learned while employed at the NSA. He learned the national security state has gone power mad. If Snowden had been a regular whistleblower, he could have kept his name out of the media. Then his story would have faded faster than a summer hailstorm. He did not try for notoriety, but his act of civil disobedience guaranteed him a place in our country’s select rank of patriots willing to sacrifice their own freedom to preserve ours. Somehow ‘whistleblower’ doesn’t capture that sacrifice.